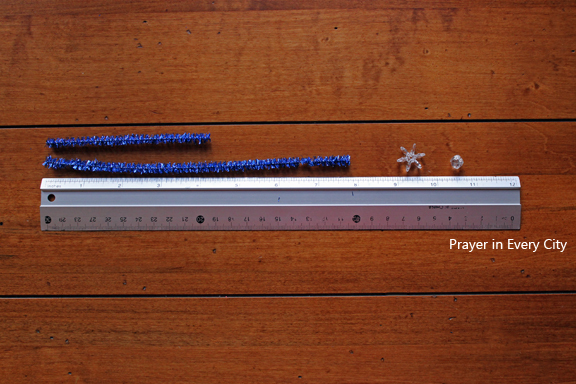 I am trying something new at Prayer in Every City. No, I am not turning my blog into a craft blog. 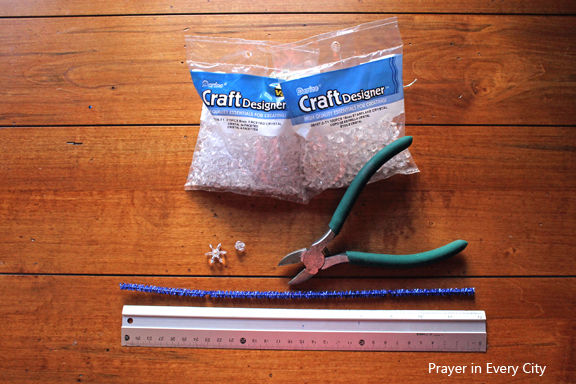 I wanted to give our Moms and Sunday School teachers an easy cross ornament for children to make. 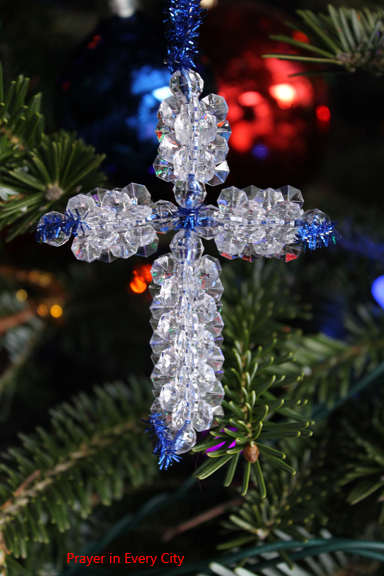 By hanging religious ornaments on your Christmas tree, you will remember to “Keep Christ in Christmas” everyday. One of my children made one of these at church so we have made them ever since. 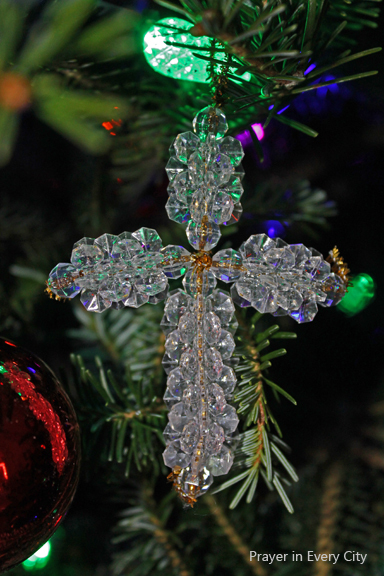 I love the way that beaded ornaments sparkle under the Christmas tree lights. I have never tried explain a craft so leave a comment if anything is unclear. The beads were difficult to photograph so I apologize that some of them are not in focus. I may try to redo some of these pictures in the sunlight tomorrow. Check back later if you can’t see the photos clearly enough. Step 1: Cut the pipe cleaner into an 8 inch piece, leaving a 4 inch piece. Step 2: Make a loop and wrap around pipe cleaner at the top of the 8 inch piece. 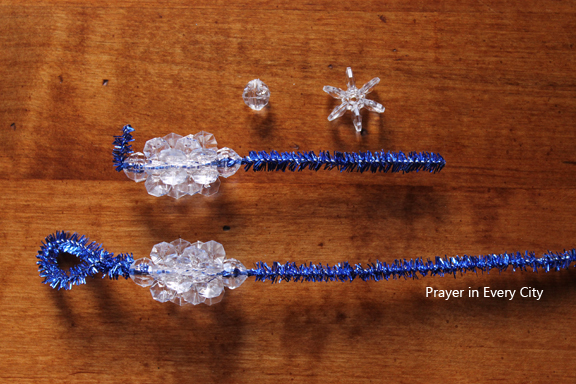 Step 3: From the bottom of the 8 inch pipe cleaner, add one round crystal, then 4 starflake crystals, end with a one round crystal. 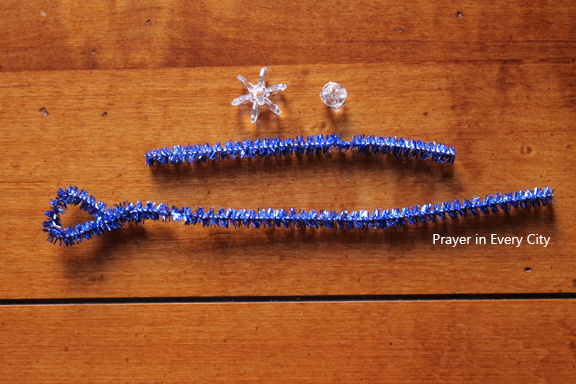 Step 4: Take the 4 inch pipe cleaner and secure the end by flipping it to make a right angle. Next add one round crystal, 4 starflake crystals, then another round crystal. Step 5: Cross the 4 inch pipe cleaner over the 8 inch pipe cleaner, wrapping the 4 inch around the 8 inch one time. 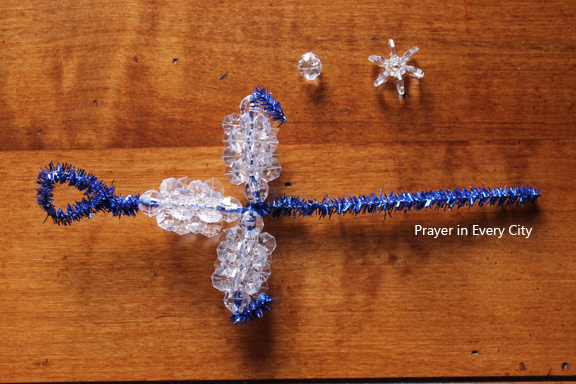 Step 6: Next we will finish the 4 inch pipe cleaner by adding one round crystal, 4 starflake crystals and one round crystal. Flip the end of the pipe cleaner upward to secure. 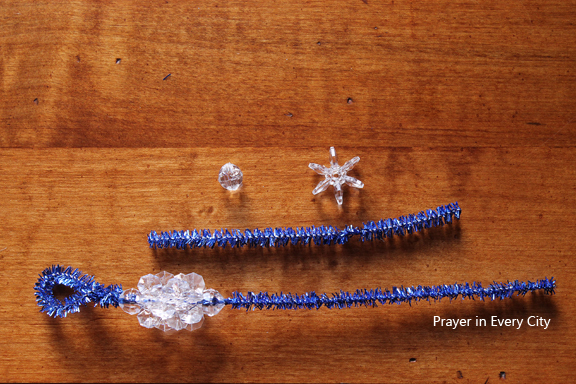 You may need to cut any excessive pipe cleaner, but leave at least a 1/4″ – 1/2″ on each end. Step 7: We are almost done. Now we will finish the bottom of the cross. Add one round crystal, 9 starflake crystals and one round crystal. 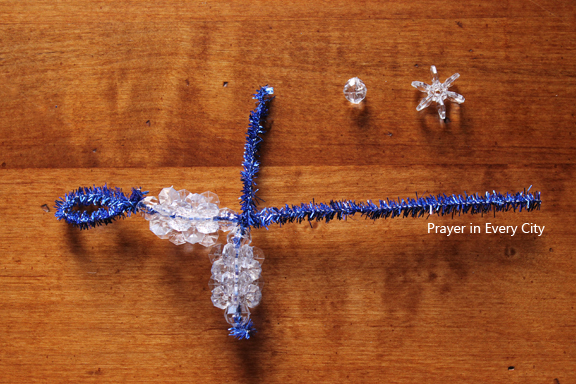 Flip the end of the pipe cleaner in an L shape to secure. Trim any excess pipe cleaner if needed. 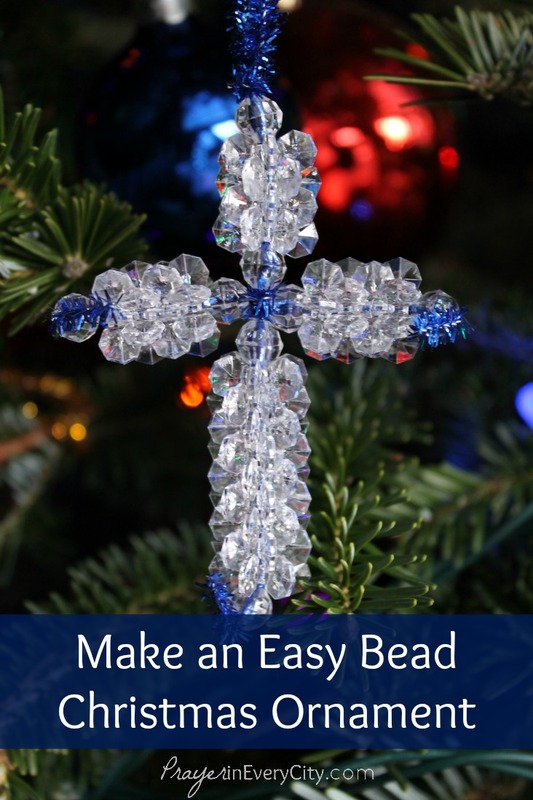 You will want to leave at least 1/4″ – 1/2″ on the end so beads will not fall off.